John McCain is a respected Republican Party leader in the United States and around the world. His life story and his accomplishment as a military officer in service to his country bare witness. He is still in active service as a senator from Arizona. He was the Republican Party's presidential candidate in 2008, when his party's toxic image contributed to his loss to President Barack Obama. Virtually, everyone agreed that if not for the toxic image of the Republican Party at that time, Obama could not have defeated the politically star-studded McCain. It is true that the party is still in a struggle to get out of the toxicity, and one of the reasons observers say the party's voters have chosen Donald Trump, a non- career politician as the party's nominee for the next presidential election against Washington politicians toward total cleansing of the party. Just this past weekend, McCain called on the warring members, who are angry against the emergence of Trump, to humble themselves, and embrace the party's nominee. He said that he expected to vote and support Trump, but that Trump should first apologize to the veterans, for his statement that he McCain was not a Vietnam hero for having being captured by the enemies. Trump had said he would have preferred McCain as a hero, who was not captured. Many Republicans raised eyebrows for what they called Trump's lack of respect for a hero. It was the beginning of the argument between Trump and large number of conservatives, who are saying they would not support trump's campaign. But now that McCain had said it would be foolish of any party member not to support trump, it seemed that an end to the disagreement in the party that would pave way for Trump's unification of the party and beginning of saving the Party from toxicity of the past is in sight. With Paul Ryan's statement in the New York Times that he will step down from being the chairman of the party convention if Trump asks for it, shows an agreement that everyone is accepting the fact that Trump is the new leader of the Republican Party. Observers say they expect the same sense of humility from Trump, since both McCain and Ryan have shown the same in their words. They say that Trump can apologize to the veterans, but that he must not accept the old dogmas of the party's establishment as a way to go forward. Trump should equally be seen as not treading on a hard line. Everyone sees McCain statement in his interview with the CNN as representing a divine flash of light coming from a man of McCain's age. 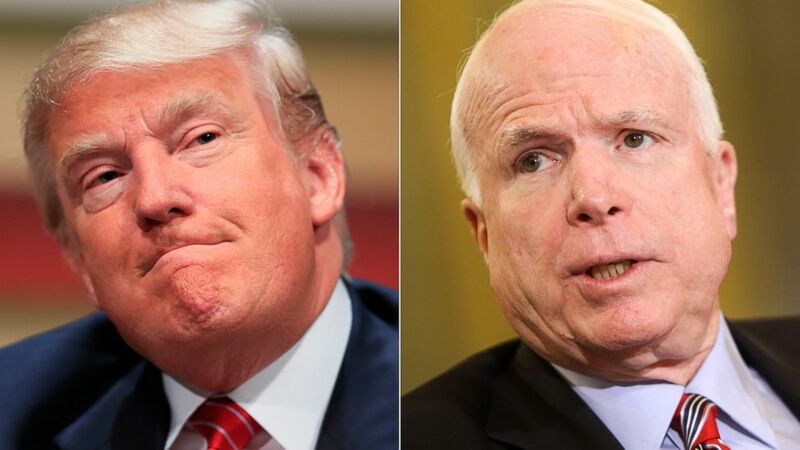 Although, Trump is also not so young for people to expect him to prostrate the way a young man of 40 years would do to a man of 80 years, but he is nonetheless expected to see McCain's utterance as an intervention by higher powers in his favor. After embracing the fugitives in the party and the party members are fully reunited, notwithstanding that there are bound to be some totally disgruntled ones, the party can then move ahead and begin to debate with voters the need to build a wall between the U.S. and Mexico, to keep illegal immigrants and drugs away. The issue of temporarily banning Muslims from coming into the country, while the country's representatives and Arab leaders resolve a way forward about how to curb terrorism can also be debated. Many people believe that America can take any decision, no matter how hard, to protect the people, since it is known that terrorists as killers come from a particular area of the world. And that it is left to leaders from the areas where terrorists come from to show enough inclination toward helping to keep these terrorists away, for America to open its doors to their people and the ban does not become permanent. It is not that Americans don't love or no longer love the people coming from that part of the world, but that the necessity to stop the terror hemorrhage at home has forced on the people the beginning of a search for a lasting solution, just like no family will open its doors endlessly to friends, who will constitute continuous danger to its members. The Republican Party can claim to have a sizable votes from religion inclined immigrants from the Arab land and may want to avoid being hard on the people to have their votes, but still this cannot be done at the expense to other people's lives. The party cannot claim to have a sizable Latino voters before Trump's wall debate. Many Latino voters said in 2012 that if Mitt Romney had chosen Marco Rubio as a running mate, they would not have voted for him, because as Latinos they are known to vote Democratic Party. Therefore, it is unacceptable to think that stopping the building of a wall will make Latino voters vote for the Republican Party. The Republican Party will not be losing the Latino votes because of Trump's plan to build a wall. America cannot continue to allow illegal trooping of undocumented aliens into the country, when the visa system is still in place. It is the duty of all members of the Republican Party to bury the hatchet and unite to raise the party's fortune with the possibility of increasing Latino votes for its candidate with the new momentum that Trump has brought to the party.